Acrobat.com includes several free content creation tools that can help out in a pinch or even be a regular part of your workday. Most of the web-based apps are collaborative, and Adobe will even host your files, so both the application and documents can be accessed on any computer. It's a great touch if you bounce between machines and don't carry a USB drive. Among the tools, Adobe Buzzword is a word processor and Adobe ConnectNow handles online meetings. Plus Adobe has just released its presentation tool, simple called, Presentations. All of these tools just take a system powerful enough to run Flash. (Most of the tools require Flash 9, while Presentation needs Flash 10.) You'll create a free account, log in, and begin creating content. Buzzword is a featured word processor. You can adjust fonts, formatting, and other text basics, including creating outline layouts and inserting images. But like the rest of Acrobat.com, Buzzword is great for collaboration. Similar to Google Docs, you'll invite a contact to view or edit one of your files, and you can even make changes at the same time. A commenting tool lets you also add notations, so group members see your reasoning behind edits. Buzzword imports and exports Word, Open Doc, text, and RTF files, while it also exports as PDF, HTML or .epub, Adobe's e-reader format. ConnectNow handles online meetings. Up to three people can share desktops and documents in the live screencasting tool. Its built-in VoIP option handles spoken conversations--a chat window works for typing--plus a collaborative whiteboard lets everyone focus on the same thing. Presentations, the newest addition, lets you create, store, and modify PowerPoint-style presentations as a group. The service is separated from these other tools, hosted at labs.acrobat.com because it has more, critical features coming. For example, Presentations can't yet export PowerPoint files--a deal-breaker for many small businesses. However, Adobe is actively working on adding that option; the company expects it by the end of the year. Presentations still looks good in its initial state. Like Buzzword, you have lots of control of the document style. Adobe proudly says that it uses its own fonts, graphics, and layout technology versus relying on HTML. You can even add FLV movies, for example. It also includes many preset theme options and ways to build your own motifs to carry across slides. 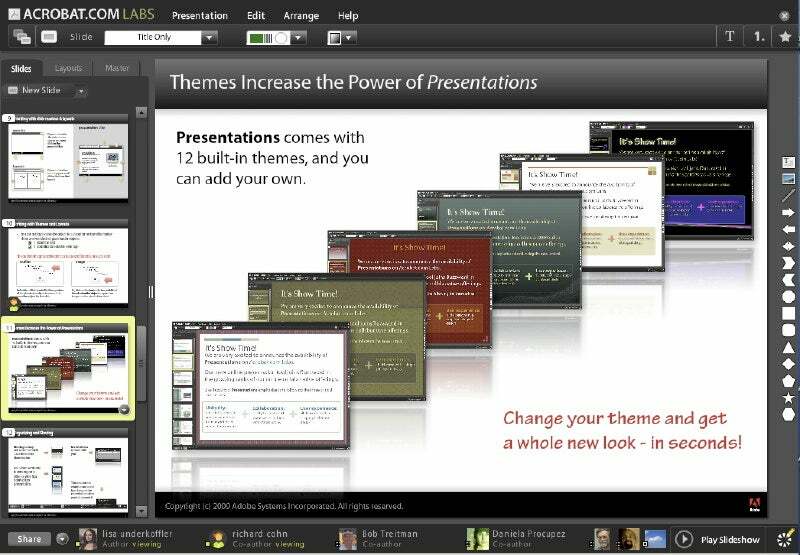 Overall, Presentations follows the familiar slide-creation paradigm of PowerPoint. Unlike that Office app, You can invite an unlimited number of people to view or edit the files, making Presentations a hub for both collaboration and showing off slides. It only exports PDFs at the moment; if you need to use those documents outside of the tool, you might want to wait until it can save as PowerPoint and other file types. Zack Stern contributes regularly to PC World and other technology publications.